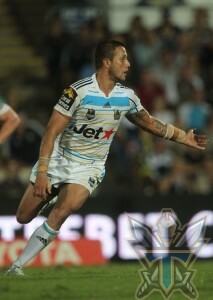 Scott Prince showed his true colors last night getting the Titans home in a nail-biter 20-14. After trailing for the entire match Prince (pictured left) levelled the scores with a couple of beautiful “show and goes,” getting him past the first and second line of defence before touching down behind the posts. Both sides then looked for field goals before two uncharacteristic mistakes from Tigers prop Todd Payton gifted Gold Coast excellent field position and Man of The Match, Mark Minichellio went over to score. Scott Prince’s face post match said it all. At the press conference he tried hard to conceal his excitement, but it was etched on his face. He tried hard to act serious but couldn’t hide his joy. Apparently the boys enjoyed singing the team song last night. Up till then it had been one win from five rounds, leaving the Titans in their lowest position on the ladder since entering the competition….last. Prince said in the end belief had got them home. Gold Coast started the match with one possession in the first 15 minutes and it seemed like Groundhog Day for the 17,000 Titans fans attending. Dwyer and Heighington had both crossed for the Tigers by the 12th minute and Benji had converted from three attempts. But the Titans hit back before the break with Will Zillman scoring twice inside three minutes, using the one element you can’t coach – speed. The Tigers team that returned to the field after half time didn’t play like the usual boys from Leichhardt. There was no razzle dazzle, no Benji brilliance, none of the football the Tigers have made their own, none of the football that makes them so exciting to watch. Tigers Captain Robbie Farah said post match, “I can’t remember getting tackled inside their 20 in the second half. We dropped the ball, gave penalties away and gave them field position, you can’t do that. Sheens said he was disappointed they had gifted Gold Coast so many opportunities and handed them the match. He also had a few words to say about his former apprentice, Scott Prince.